Indiana University of Pennsylvania’s Eberly College of Business and Information Technology has been recognized in U.S. News & World Report’s 2018 Best Business Schools ranking. IUP’s Eberly College was recognized as fourth in the nation for the number of international students (82.7 percent) in its Master of Business Administration (MBA) program. There are approximately 1,600 schools or colleges of businesses in the United States. The Eberly College has consistently been ranked by national publications for excellence, including 14 years in the Princeton Review’s Best Business Schools publication; as a “Best for Vets” Business School by Military Times and was one of 15 graduate schools of business in the nation named to the Princeton Review’s second annual “Student Opinion Honors for Business Schools,” featured in Entrepreneur Magazine. Eberly College has partnerships and exchange agreements with universities around the world. IUP welcomes close to 900 international students from more than 50 countries annually, and about half of the university’s international students at IUP are in the Eberly College. About half of the faculty in the Eberly College were born outside the United States. The Eberly College has established comprehensive partnerships in India, China, and the Middle East and is actively pursuing similar partnerships in other parts of the world. Programs include the India PES University Program, Palestinian Territory Arab American University Program, Chinese Business Programs, Summer Certificate Program, Global Academy in Business Leadership, Europe Symposium, Discover India Program, and Discover Norway program. Programs are for a variety of time periods and are open to both undergraduate and graduate students and all majors. About 50 students in the Eberly College choose to study abroad in one of the College’s international programs. “IUP has earned a well-deserved nickname with our global partners—International University of Pennsylvania—because of the extensive international programming and opportunities through our undergraduate, graduate, and certificate programs,” said Prashanth Bharadwaj, dean’s associate in the Eberly College and director of the international programs. The Eberly College includes a 44-station financial trading room, which allows students to create hypothetical portfolios and track all purchase and sales transactions in order to gauge performance and document trading strategies. Students in the award-winning Student Managed Investment Portfolio program invest and monitor actual university funds; currently, students are managing university assets of more than $1 million. The Eberly College also houses an advanced trading room equipped with Bloomberg terminals. The latest additions at Eberly are a digital production studio and lab, where students learn how to create and edit streaming video for training presentations and websites. The Eberly College first achieved accreditation of its bachelor’s and master’s degree programs in business administration from the Association to Advance Collegiate Schools of Business International in May 2001. This accreditation was reaffirmed most recently in April 2016. Fewer than one-third of the business schools in the United States and a limited number of schools internationally have earned AACSB International accreditation. IUP, recognized routinely for excellence by publications like the Princeton Review, Money magazine, Forbes, and Military Times, offers more than 140 undergraduate majors and more than 60 graduate programs. In addition, students can complete more than 65 minors and scores of specialized tracks and certificate programs, including certificates in athletic coaching, gerontology, photography and digital imaging, popular music, and public history. With the recent addition of the PhD in business program—the only program of its kind in Pennsylvania—IUP now offers 14 different doctoral degrees. 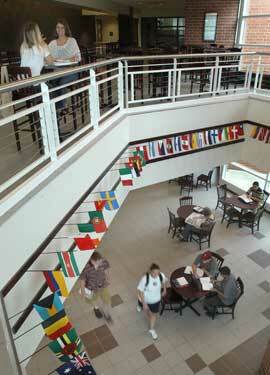 IUP is one of only four public, doctoral research universities in Pennsylvania.